Here’s the latest report–we’re on the ground and fighting the leftist organizers in the trenches of Wisconsin! 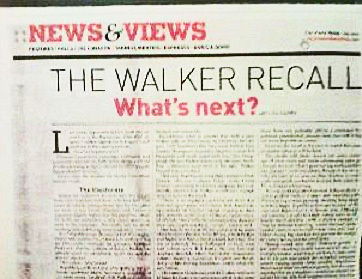 We got a sense of just how stacked the deck is, and what we are up against, as soon as we picked up the newspapers this morning. 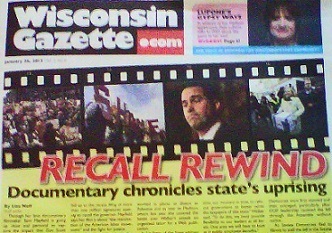 Consider these headlines alone: they are all about cheerleading for the RECALL and attacking Gov. Walker and implying he’s done something wrong – when in fact he’s done absolutely nothing wrong, and has been one of the best leaders in America the past two years. We are in the middle of a $100,000 Money Bomb to DEFEAT the RECALL and we are going to need everyone’s help to reach this goal. The money we are raising is to pay for our TV and radio ad campaigns and to fund the War Rooms we are setting up across the state. We’re going to post an updated list of people who have contributed $200 or more to support our $100,000 Money Bomb to DEFEAT the RECALL. You can have your name added to this list by making a contribution of $200 or more online – HERE. Please, help us reach our $100,000 Money Bomb goal by making a contribution online – HERE. Thanks so much everyone for your help and support. We’re going to win this fight, we’re going to DEFEAT the RECALL, and we’re going to stop Barack Obama from getting Wisconsin’s 10 Electoral Votes!